Before last year’s ESPN’s “College GameDay” show came to the University of Virginia’s John Paul Jones Arena, UVA Today asked statistics department lecturer Rebecca Hehn the odds of a UVA student following in the footsteps of two previous ’Hoos and making a shot from half-court on the first attempt. Based on an ESPN calculation that a shooter has a 1 in 100 chance, Hehn said it would be roughly one in a million to complete the trifecta. Clearly, Angus Binnie didn’t let all the data get to his head. 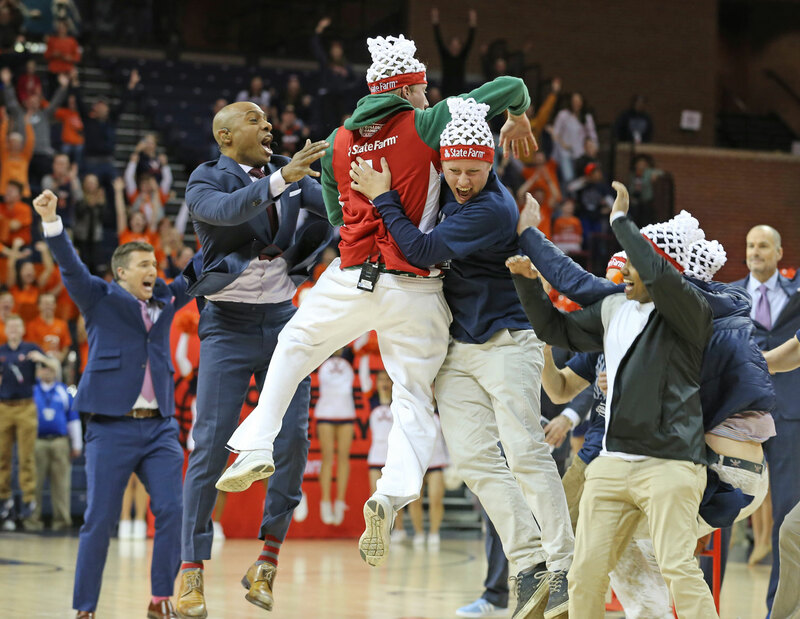 The second-year foreign affairs major from Connecticut did what former ’Hoos Tyler Lewis and Andrew Board had done in previous years: stroll to the center of a raucous JPJ and, in front of prominent ESPN personalities and a national television audience, calmly sink a nearly 50-foot shot. While it took three attempts, Binnie – like Lewis and Board before him – pocketed $18,000. According to ESPN, UVA’s three successful half-court shots are the most in the history of GameDay, ahead of North Carolina (two), Duke (two), Butler, Notre Dame and SMU. It begs the question: With GameDay set to return prior to the Duke game on Saturday, can a UVA student sink the shot yet again? Bill Hofheimer, ESPN’s senior director of communications, certainly isn’t about to put anything past UVA students. Before the GameDay contest takes place, ESPN has several students fire up half-court shots in a JPJ practice gym, then picks the person they think has the best chance of making the shot. In the actual contest, the shooter has 18 seconds to make one. Binnie played high school basketball and said he would often take half-court shots after practice for fun. Prior to the GameDay contest, Binnie said he had hit a few while playing at the Aquatics and Fitness Center. But the AFC is a far cry from center court on an ESPN broadcast. Did Binnie feel any pressure following in the footsteps of Lewis and Board? After making the shot, Binnie was swarmed by ESPN commentators, fellow students and even members of the UVA team who were in attendance. Binnie, who plans to be in attendance for this year’s GameDay, said he has yet to spend any of his prize money. What would Binnie’s advice to this year’s shooter be? And definitely don’t think about those odds.